I love the Soul Calibur franchise. To me it’s like the best fighting series since it’s easier to pick up and play than Virtua Fighter and Street Fighter. 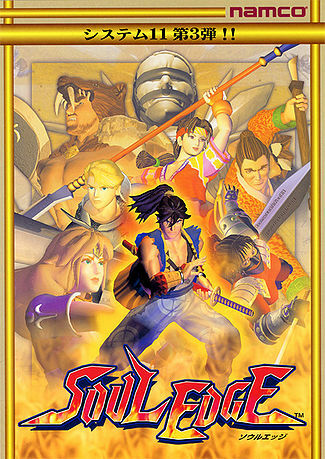 A lot of people really know Soul Calibur more from its port on the Sega Dreamcast, where it was made an official franchise, than the arcade version. However, it seems like people always think of Soul Calibur as the first game in the series, but it isn’t! That’s right, people, Soul Calibur isn’t the first game in the franchise! It is actually the second game in the franchise, coming after a game called Soul Edge or as it is called here in America, Soul Blade. Yes, that’s right the first game in the series came out on the Playstation and was called Soul Blade. I can see why a lot of people overlooked this, since a lot of the characters don’t even look like the ones of today, though they did miss out on a great fighting system for its time and a great opening FMV intro to the game. Let’s slice our way through, and review Soul Blade. Now, by the date that Namco has put out in a timeline for the series, this game takes place in 1584. The story gives us the legend of the Soul Edge, a powerful sword that warriors from all over the earth have tried to find and wield. The sword has now taken the form of two swords, and has been obtained by a pirate captain known as Cervantes. Now, 9 other warriors are on a journey to find Cervantes and get the sword for themselves, with each character having a different goal in mind. It’s basic Soul Calibur storyline, but it’s a fighting game, so who cares. right? The gameplay is of a simple 3D fighter. I like this approach since this was the time when 2D fighters were coming into 3D and were not as good, like the Street Fighter EX series which isn’t a favorite for anyone. It plays out more like Rival Schools with some combos, but a simple fighting system where you can be offensive, but somewhat tactical with your moves. You basically have the standard modes like a story mode, arcade mode, and versus mode where you can choose from 10 characters. By today’s standards, that is not an acceptable number, but back then and probably due to limitations of technology, it was probably a big list. Like I said, if you played games like Capcom’s Rival Schools or Star Gladiator, which are two great Playstation fighters, then you will like this game’s simple, but effective fighting system. There are also endings that play out like the endings in Soul Calibur 3, where you either need to press a certain button or go through a certain mini-game. I don’t mean quick-time events like in God of War or Darksiders. For the specials for the Playstation version of the game, each character has different weapons that have special powers or attributes, which is always a staple in the future games in the series. Now, graphically, I still think the game looks good. Some things haven’t aged well, like the arena you all fight in, but I grew up with a Nintendo 64 so I think it looks good and has a nostalgic charm for me. Hands down one of the best features of the game, besides different outfits and weapons, is the soundtrack. Soul Calibur has some of my favorite tunes of all time and they are fun to listen to. Composers Takayuki Aihara and Takayuki Ootsura definitely know what they are doing when composing such great songs for the game. Another great thing that people often seem to say is one of the best features of this game is the opening intro for the game. I have to admit I thought it was a little cheesy, but it is rather awesome. Now, it is time to pick up our weapon and bash in the bad parts of the game. While I like the simple fighting system, maybe it is a little too simple. It results in somewhat sluggish combat by today’s standard. One thing that I just HATE about this game is that you’re forced to use the directional pad on the controller. Why the heck Sony didn’t make controllers with analog sticks in the first place will just confuse me for the rest of time. I think this is a major issue with Playstation games since it makes fighting games harder than they should be, due to stiff movements because of the directional pad. I also find characters with huge weapons like Siegfried to be at a disadvantage since they attack slowly and move slowly. It seems unfair since when I got up to Cervantes for the first time, I got really annoyed when it was hard to move and attack. The nother thing that bugs me about Cervantes is that he is so cheap and overly powerful and is just a pain to fight. Even with its shortcomings and a few areas where it doesn’t age well, Soul Blade is a fun game. You can easily pick this game up for about 15 dollars or less. If you are ever interested to see where this great fighting franchise got started or you are just looking for a good game to keep in your collection, then I see no reason why this game shouldn’t be in your collection.